Thanks Janel, yes I think I will move on from chains, they look great when finished but they are so labor intensive, I still need to attach a cord or chain, may do a custom plated cord either in black or red. Yes Janel, the final polishing stages can be demanding and this chain is very difficult getting at all those little tricky spots, finally finished. Thanks Janel, it is very translucent, a very challenging carving, rhodonite is not as tough as jade and is more prone to fracture, but this piece is the best I have carved, still quite surprised it stayed in one piece, the next stage is sanding and polishing, takes easily as long as the rough carving stage. My first chain, jade is the preferred stone for these but my idea was to carve one in a stone that has not been done before, its very hard and fine grain rhodonite, still in progress. Thanks Jim, yes the curve is what inspired me to carve this shape, based on a nautilus but with my own twist on the opposite side, I carved a series of cut steps through the potch to reveal the opal. A Little shell I carved from Lightning Ridge opal, it was my entry in the International opal awards in lightning Ridge last weekend. Thanks Ken & Ed, I hand sand & polish all my local nephrite jade, no rotary tool will give the same finish, some jades are bad for polishing, better to finish them on 1200 carbide paper dry, I have my procedure working good on my local jade, other locations still try my patience, this one was smoothed on diamond and polished on linde A, - alumina A, I may try to cave wood one day, my property here in Australia has heaps of timber, all native gum, box, red gum, have seen some awesome pattern in our white box, hard and heavy. 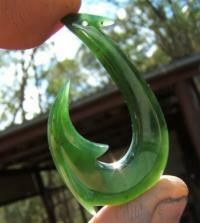 Its been quite a while since I have posted here, better late than never, my latest carving in Australian nephrite jade, some say it looks like the star trek badge. I have been working on this little jade fish for the last 3 weeks, getting close to finish, its Aussie nephrite jade, the black eyes are Western AU ferro actinolite, 50 mm long, the eyes are set into the green jade. Thanks Ed, I like your dragonfly's, my wife Margie likes the white one, you are very versatile with your carving, may one day try a wood carving, only ever carved gemstone.